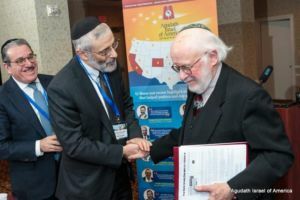 L to R: Shlomo Werdiger, chairman of Agudah’s Board of Trustees, Rabbi Chaim Dovid Zwiebel, Agudah’s Executive Vice President, together with Nat Lewin, noted constitutional attorney who drafted the amicus curiae brief, at the Agudah’s recent Washington Mission. The United States Court of Appeals for the Seventh Circuit has ruled that the parsonage allowance, an allowance provided for housing expenses to members of the clergy that is exempt from federal income taxes, is constitutional, overturning the lower district court decision that had ruled to the contrary. The Court held that the parsonage allowance had a secular purpose, to treat religious employees similar to secular employees, who also receive tax exemptions for housing expenses that are work-related, and ruled that the parsonage allowance did not create an unconstitutional entanglement between government and religion. Agudath Israel of America had joined with a number of other national Orthodox Jewish organizations in an amicus curiae (friend of the court) brief urging the US Court of Appeals for the Seventh Circuit to uphold the constitutionality of the parsonage allowance. The brief, written by noted constitutional attorney Nathan Lewin on behalf of the National Jewish Commission on Law and Public Affairs (COLPA), asked the court to reverse the ruling by the Wisconsin federal district court that the parsonage allowance violates the constitutional prohibition against establishment of religion. The parsonage allowance provides a benefit to rabbis and religious teachers, among others, who can exclude this allowance from their gross income when calculating their federal income tax. The Internal Revenue Code provides for similar tax exemptions for housing allowances provided by employers where the housing is “for the convenience of the employer”, and it is the same tax principle that allows businesses and the military to reimburse its members for travel and overseas housing costs, and provides tax-free housing to teachers and police who live in the communities they serve. The brief argued that members of the clergy should not be treated differently, and this was one of the key points made by the Court of Appeals in its ruling.